We are spending some time looking back over the Boston Celtics championship season… in an effort to truly appreciate the efforts of those involved. In our sixth installment of our series, we continue our appreciation of the players. Where do you start with Glen Davis? To just focus on his goofy antics and attitude would undersell the effort he puts in on the court… which is significant. To spend too much time on the reconstruction of his body, and the high energy he brings just by being in the game, doesn’t fully capture how wild a guy he is. This is the first Red’s Army headline that has gotten our wives’ immediate interest. Nowadays, Big Baby, who got his name for his size and sensitivity during his elementary years in Louisiana, has a daily regimen of moisturizing, brushing and buffing himself into top form. Those habits include liberal use of Lubriderm lotion to keep his hands soft. He gets manicures twice a month, and favors – without apology – a clear top coat. The stereotypical “guys-as-grimy-and-rough” image is outdated, he said. Well… at least Chuck has company now. Baby says a few teammates do similar stuff. Whatever. This is all part of Baby’s new endorsement deal with Ace grooming tools. The most redeeming thing about this whole thing is that he’s wearing the Gino shirt… which you can buy here to support the Celtics Shamrock Foundation. Add Glen Davis to the injury list. Big Baby went down hard tonight and had to be helped off the court. What looked like a serious knee injury turns out to be a strained quad, according to the Celtics. And to make matters better worse, Brian Scalabrine left the game in the 1st quarter with a strained groin. On a brighter note, Comcast had video of KG working out prior to the game. He looked smooth and pain-free. Expect Garnett back immediatley after the All-Star game. And speaking of the All-Star game, Ray Allen was named to replace Caron Butler. Congrats Ray. Oh yeah, the Celtics beat the Knicks, 111-103, in another uninspired effort. Dumb Coaching Move of the Night: After the Knicks cut a 27 pt lead to 11, Isiah got nailed for a stupid, momentum changing technical foul. After Ray nailed the free throw, Leon threw down a nasty dunk, and then Tony Allen had one of his vintage follow-dunks (circa 2005). Momentum back to the C’s. Thanks Isiah…. Best Coaching Move of the Night: Shortly after, Isiah got his second technical and was ejected. The Knicks officially had a chance. Breaking News: Devean George is attempting to block the Nets/Mavericks trade which would send Jason Kidd to Dallas. With KG and Perkins out, the Celtics needed a total team effort to beat the Spurs. Well they got it, 98-90. Words nor stats can describe the defensive intensity brought by the C’s today. 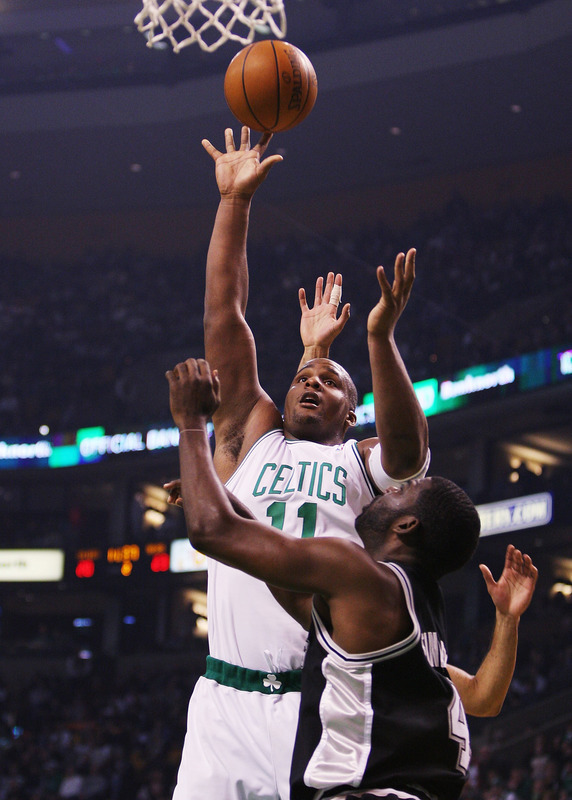 Glen Davis (9 pts, 8 reb, 3 stls) deserves a ton of credit for playing Tim Duncan one-on-one. Duncan had a great line (22 pts, 14 reb, 6 assts), but Davis was simply superb. Paul Pierce (35 pts, 5-9 3FG, 6 reb) also nailed countless big shots. And guess who lead the team in rebounding? Rondo with 11 (one of which was a huge, one-hander after a Ginobli miss in the final minute). Needless to say, this is a huge win. The Celts are now 16-0 against the West and 5-2 without Garnett. I also know this is a little skewed, but the fact that his per 48 minute numbers right now are 26.1 ppg and 15.9 rpg says something. Would he put up 26 and 16 if he got starter minutes? Nope. But numbers that extrapolate out like that show that the few minutes he’s getting are extremely productive. Besides, Leon Powe has a glare that can scare the platinum off a rapper’s teeth. He’s 6′ 8″, but he’s afraid of no one… and few people can push him around. Doesn’t every team need an enforcer like that? Yes… I said “extrapolate.” I guess I should also point out Big Baby’s new nickname: Ticket Stub. Sure Glen… whatever you say buddy. They stole one in our house…. we stole one in theirs. This is what happens in rivalries. Goofy plays (like the upfake), unsung heroes (hello Big Baby) and the possibility that no matter where these teams play each other, either team is just as likely to win. It was also nice to see our 3 big stars, especially Paul Pierce (who always gets such a bad rap for being selfish late in games), recognize that Davis was the guy who was both open and hot. There was no “oh, he’s a rookie… I’ll just force this shot up” attitude in this game. The only forced shot was from Pierce with no one open and the shot clock ticking down. 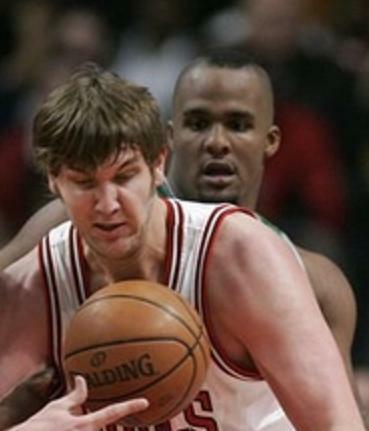 And even then, it was Big Baby who was there for the biggest rebound of the game. By the way, the Celtics are STILL undefeated in back-to-back games this year. I still find that amazing. No let downs. The C’s are now off until Wednesday. And check out our latest T-Shirt: I Bleed Green. As usual, you can click on the photo for that particular shirt, or go to our store for more styles with that design… as well as the rest of our now vast selection. The Celtics got their revenge on the Pistons… going into their building… and unleashing Big Baby. Down 66-63 going into the 4th quarter, the Celtics got 16 points out of Glen Davis (on 6-6 shooting) in the 4th and they beat the Pistons 92-85. Not only that, he got a HUUUUGE offensive rebound at the end to keep a possession alive. Paul Pierce was feeding Davis all night… and The Truth ended the night with 19 points, 9 rebounds and 7 assists. I don’t know what happened to Glen Davis over the past few weeks as he racked up DNP’s all over the place. But I have a hard time believing he’s going to get more DNP’s after this. Chuck and I were playing a fun little drinking game… every time the Celtics missed a layup… we took a drink. Chuck is still passed out. I’m on my way to get my stomach pumped. At one point… we put the shot glasses away and just started drinking from the bottle. Mind you… the Celtics won this game… but they won it 80-70… but this was easily the worst C’s game of the year. People who went to this game should sue… or at least they should be able to get one of those Men In Black flashy-thingy’s done to them. What’s wrong with Kevin Garnett? He seemed out of it. I know we’ve come to expect double-double greatness from him every night… and everyone is entitled to an off night… but he was 2-12 from the field and he kept settling for the back-the-guy-down move where he fakes right and turns left into a fadeaway jumper. I’m hoping that this is just a bad stretch for KG. I don’t like that this bad stretch comes with the arrival of a knee brace. Maybe its all that Wild Turkey talkin’ here… but I’ve gone from “it’s no big deal” to “hmmmmmm” on KG. 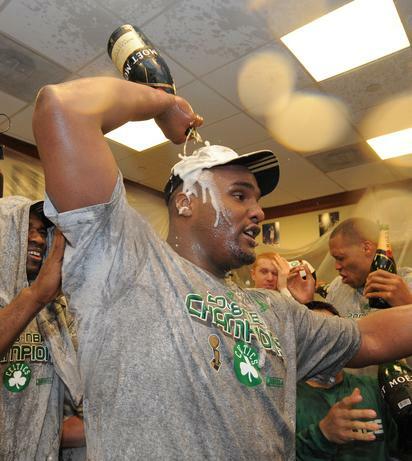 On the plus side, we got a big dose of Big Baby, and Glen Davis did not disappoint. I’m sorry Leon Powe, you’re officially the last guy off the bench. Your problem, Leon, is that you’re too jacked and you don’t have a nickname. Big Baby is a fat guy who does the same stuff you do. Therefore, it’s more fun.